A new Commute Seattle survey conducted by EMC Research shows that more than 70 percent of downtown’s estimated 247,000 daily commuters opt for transit, ridesharing, biking, walking and teleworking – leaving less than 30 percent of commuters to drive alone to work. Public transit (bus, light rail, streetcar and train) remains the top choice for downtown commuters (47%), with ridesharing (carpool, vanpool) holding steady at (9%), walking (6%), bicycling (3%) and teleworking (3%) rounding out the 70 percent of commuters not driving alone. Due to job growth and changes in commuter behavior, the survey provides a unique snap shot of the daily peak trips coming to and through downtown. There are 31,000 more daily peak transit commuters, 9,000 additional non-motorized commuters, and 2,300 more vanpool/carpool riders since 2010. During that same period of time, single occupancy vehicle trips to downtown increased by only 2,255 during peak hours, enabling our transportation system to absorb record job growth. Download the full info-graphic here. Due to a significant shift in commuter choices, downtown Seattle has been able to absorb substantial job growth with a minimal increase of cars on the road. These shifts are possible in part due to voter-approved increases in capacity. TransitNow, the Seattle Transportation Benefit District (STBD), and Move Seattle have provided funding for new transportation options for downtown commuters. Notable additions include City of Seattle and Metro coordinated service expansion of the RapidRide lines and restructures in NE Seattle and South Lake Union, protected bike lanes on Second Avenue and Westlake which enhance safety and bike capacity to and through downtown. Meanwhile, Sound Transit’s light rail expansion is connecting the region’s highest-density education, housing and employment centers. On top of U-Link’s opening in 2016, additional extensions to Northgate (2021), Lynnwood (2023) and Bellevue (2023), as well as ST3-funded service expansion will further improve the region’s ability to absorb job growth while maintaining critical mobility. In partnership with the Downtown Seattle Association, the City of Seattle, King County Metro and Sound Transit, Commute Seattle has focused efforts on downtown businesses and property owners to help them develop commute programs, infrastructure and incentives for their employees and tenants that support smart transportation choices. In turn, downtown employers invested over $100 million in infrastructure and transportation benefits in 2016. “Hines is a big believer in supporting alternative transportation and reducing the number of cars on the road. At several of our properties we invest in bicycle amenities that make it easy for tenants or visitors who choose to cycle. It’s good for the environment, good for wellness and good for business,” notes Kathy O’Kelley, Vice President of Property Management at Hines. 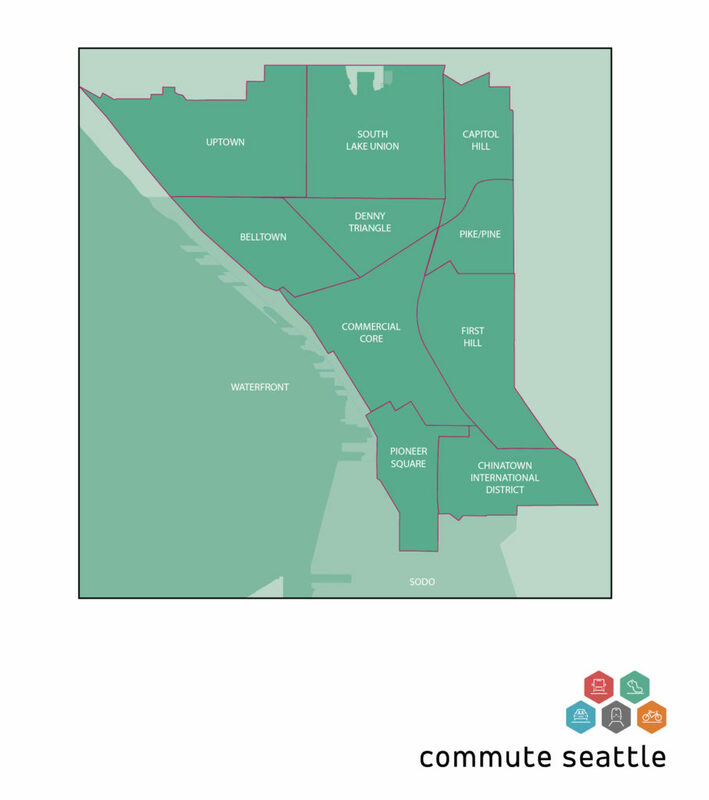 For more information on how you can implement transportation benefits for your employees or tenants contact Commute Seattle at info@commuteseattle.com.